Gedling 4th in the table v Vics 1st in the table......looked like it should have been a tight game, and it was. Early doors, the teams cancelled each other out to a degree, and with the gusting wind, poor finishing and good defending this was never going to be a high scoring game. James Mason in the Town goal tipped over effots from Sean Gummer and Michael Lyons, while Vics' keeper Wayne Smith had little to trouble him. Rob Gill almost levelled for the home team on 52, a neat run and shot -- the ball cannoning off the crossbar with Smith well beaten. Jack Davies hammered a shot at Smith from almost 30 yards and the Vics' keeper did well to smother the ball. Town thought they had levelled in the 65th minute when Ryan Johnson lifted the ball over Smith - but team-mate Eugine Francis decided to make sure the ball went into the net even thought he was well offside. If Francis had have left the ball alone, the goal would have stood ... as it was the lino, quite rightly, flagged for the offside much to the dismay of the Gedling faithful. Gedling did pull level on 71, a Jack Davies free-kick eluding everyone, including Smith, before nestling in the back of the net. This Jack Davies free-kick went straight into the net!! The home team were level for only 6 minutes though. 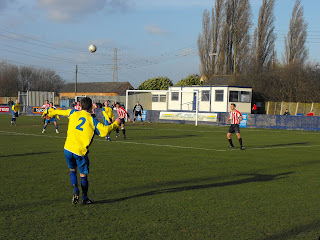 Gedling central defender Gary Smith gave away a needless corner, and was made to pay dearly as the ball in from the corner was headed powerfully home by MARC STRZYEWSKI some 12 yards out. Right on full time, Francis had a simple chance to make amends for his earlier error, but when the ball reached him 4 yards from goal, he somehow contrived to fire way over the bar!! Town had a good shout for a penalty in stoppage time, but the ref waved play on. Not a classic - but given the conditions and the pressure, not bad at all !! Vics stay top of the table and look a good prospect for promotion. Tuesday -- Calverton MW v Southwell - initially fogged off early in the season.